Norway is pulling ahead in the race to become the first country to end the sale of new gas and diesel cars. Its goal is ambitious: By 2025, the Nordic nation wants to price out the sale of the polluting cars. And it is well on its way to achieving this. In 2017, 52% of the new cars sold were electric or hybrid cars, up from 40% the previous year, according to the Norwegian Road Federation (link in Norwegian). Last year was the third best for car sales in Norway, after 1986 and 1985, the organization said. Of the 158,650 new cars registered, 21% were pure electric cars. This figure for zero-emissions vehicles will rise to 25% this year, they estimate. Hybrid cars, which are battery and diesel or gas-powered, made up 31% of new car sales. The sale of new diesel cars in Norway has fallen from 64% in 2012 to 23% in 2017. Eight of the top 10 best-selling cars were electric, rechargeable hybrid or hybrid cars. 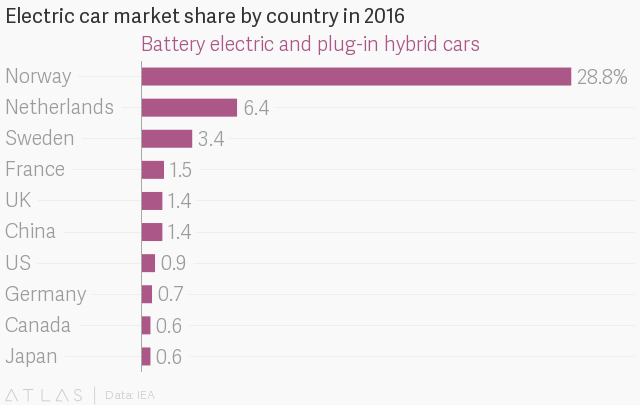 Last month, Tesla became the most popular car maker in Norway after delivering thousands of vehicles at the end of the year. Norwayâs goal is years ahead of other countries like the UK and France, which want to ban the sale of gas and diesel cars by 2040 as part of efforts to arrest climate change. China wants to become a global leader (paywall) in the manufacture and sale of electric cars and has drastically ramped up efforts to phase out polluting cars by imposing regulation on carmakers, incr easing government subsidies to buyers, and committing to building millions of charging points (paywall). Norwayâs ambition is being powered by generous tax cuts and incentives such as free or subsidized parking, charging, and use of toll roads. Some have argued that these subsidies are too good and actually need cutting back to stop them simply enabling wealthy people to buy expensive electric cars at a discount. One recent effort, dubbed the Tesla tax, which planned to remove a tax exemption on electric vehicles that weigh more than two metric tons, was promptly scrapped by the new government after opposition from other political parties. Instead, the government will abide a previous governmentâs promise to keep current electric-car incentives in place until 2020.